So you may rightly ask what I’ve been working on since I left my full-time job to work on Galapag.us. Basically, I’ve spent 3-8 hours a day pretty much converting what I’ve worked on into a more modular format in PHP, and I’ve had to learn jQuery, which has certainly made the prototyping and constructing the UX much faster and easier. As you can see below, I envision Galapag.users being able to confirm or deny information that other people add to your profile. There is a stream of updates that have been confirmed about you. I haven’t consolidated the navigation or really spent a lot of time figuring out how a person would best use the site, so I’ve just been adding a lot of different entry points into menus for adding info about others. I hate being on a web site that won’t let me interact exactly when I want to, instead of where it wants me to, and immediacy will be a key for Galapag.us both in providing less impulsively biased info and in collecting MORE data. Below I was just playing with an autocomplete search/console box. 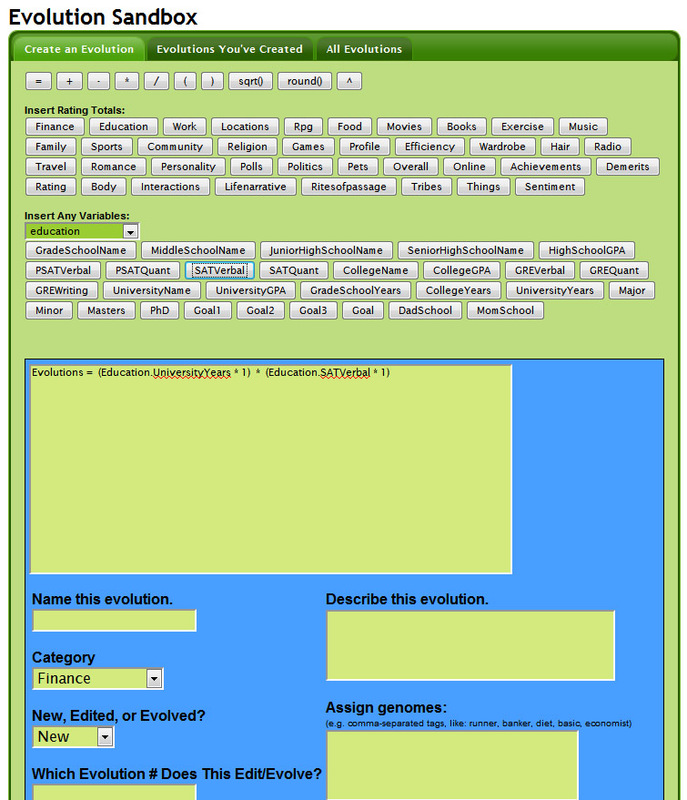 Below is the “evolution sandbox”, where you can create new evolutions (or equations/formulae). Basically all you have to do is click on the buttons for the variables you want to add, which then enter the variable into the text box below as a “dummy” variable. That is, it’s (x * 1). If x exists, then x = 1, so 1 * 1 is added to the final score. You can of course change the 1 to whatever multiplier you want. So if you had an SAT score of 600, you might set the multiplier to 0.2 so that 120 points are added to the final score. I still need to add global variables. So that your total # of books, the total # of users, etc. can be added. Definitely I’m influenced by Pandora’s attempt to give individual songs “genomes”. These are basically tags that help humans create taxonomies for finding things in the way that humans search: I’m looking for an evolution that predicts good baseball ability, but someone else’s evolution they created may not include “baseball” in any part of the evolution, so tagging it will allow people to find it. Once an evolution has been saved, you can vote on it, and create a derivation (by “evolving” it). 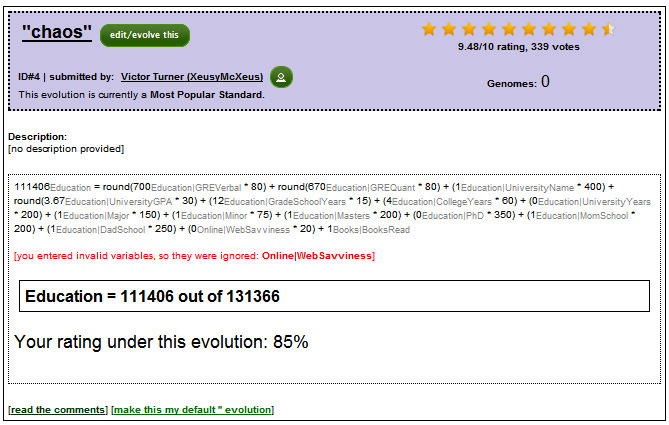 It will spit out a total for you based on your own data, and also calculate the maximum number possible in that evolution, thus giving you a “rating”. Here’s a menu that you can access through a mention of any other person’s name. Still working it out but definitely I think that people will want to classify relationships with other people based on how public it is. That is, if I’m attracted to some chick and we’ve only gone on a first date, my private status with her might be “sexual interest”, but publicly I may have her as “acquaintance” and between the both of us (bilateral), I may be a “friend”. 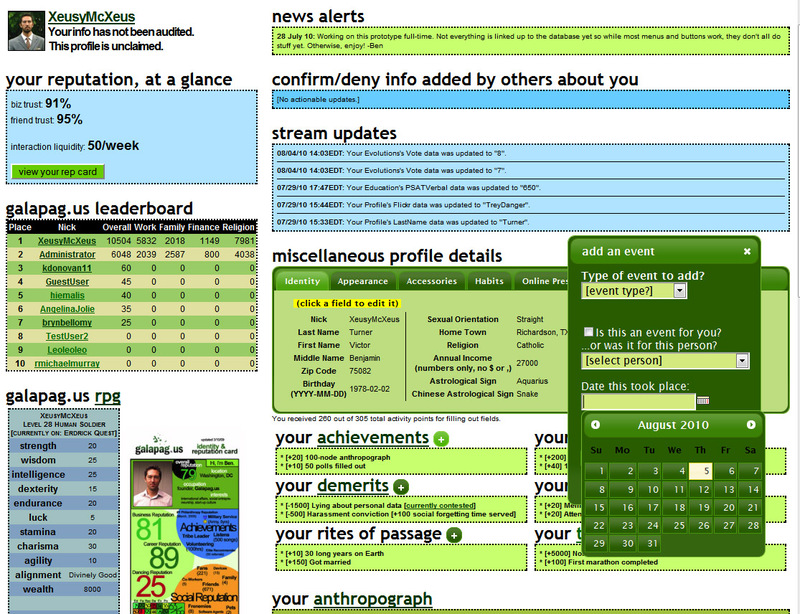 Obviously I’m still working on a lot of data entry-type stuff. This is pretty tedious, making sure the user can interact with the backend. I’d rather be working on some of the higher-order stuff. I think it’d be interesting to be building new evolutions that cross several spheres (including educational variables inside an evolution based around sports). I think it’d be interesting to start crunching the data in the database and pushing out new hypotheses for people to talk about. For instance, if people were entering in their individual clothing item data, could they gather more easily to find out where to get another one, or to trade? Would this be a better way to associate than by google searching? One could quickly figure out what data men and women tend to focus on when they first get into Galapag.us. Etc. So right now I’m constrained by a lack of data since I’m the only one who’s really using the thing right now. But that means I’m focusing on the core of the platform. It’s slow-going and I could use the help…but I do enjoy doing this full-time for the first time. You may wanna try combining some of those fields in a way that emulates Facebook’s “feed” – e.g, updates/stream/demerits/rites could all be part of the same feed, but differentiated by icons or some stylistic approach. That method would be a lot more presentable, because it opens up the layout and information base to being “skimmed”, and people can take away what they want. Having it all as individual boxes all over the place is confusing to look at, and the eyes have no idea where to go first. Just my two cents, though. Overall it’s cool to see it’s getting there!